Like all WWP program events, the sandbag workout gave warriors a chance to forge friendships with other veterans in various stages of recovery. PITTSBURGH (April 10, 2017) – Unique ways to get moving and stay in shape might not always come naturally. 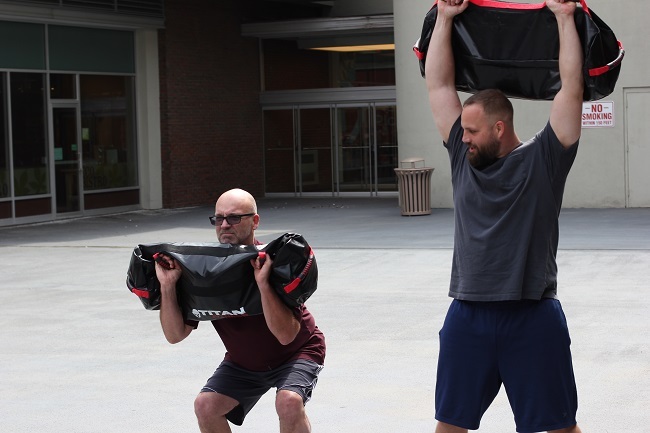 But at a recent Wounded Warrior Project® (WWP) physical health and wellness event, warriors used a workout tool familiar to many in the military: sandbags. The event was also an opportunity for connection. Like all WWP program events, the sandbag workout gave warriors a chance to forge friendships with other veterans in various stages of recovery. WWP’s physical health and wellness programs support warriors as they manage their mental health through physical activity and connecting with other veterans. In a WWP survey of the injured warriors it serves, 29.6 percent of survey respondents expressed physical activity helps them cope with stress and emotional concerns. Warriors participated in the workout at their pace with instructions on technique from staff and coaches. After warming up, warriors launched into complex movements for short bursts. From there, staff split the group into teams of three for a 30-minute competition. As for Stephen’s long-term fitness goals? He wants to be able to do the same workouts again but have the endurance not to get tired as quickly. Through tips from WWP staff, he found one way to get there.